I have wanted to grow my own sprouts for eating for a long time now, but I was nervous to do it. I didn’t want to do it wrong, or use the wrong seeds. It was enough that I just have not tried it. Then I received this book to review called, “Homegrown Sprouts” by Rita Galchus. 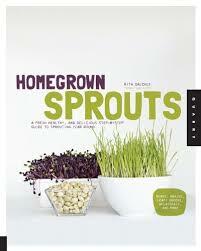 This book is a great how to guide to growing sprouts. It covers all different kinds, and all different ways! It made it seem very simple, so I took the plunge and grew my own sprouts. I decided to buy a little sprouter because growing them just in a jar seemed like it was limiting. So I found a sprouter at my local health food store, along with some seeds. They were a mix of seeds- one jar with small grain type seeds and the other with bigger ones. I have to say I have been pleasantly surprised at how easy and fun it has been. The hardest part is just remembering to rinse them night and morning. The small seeds/grain mix is great to add to sandwiches and salads. But by far my families favorite is the large seeds mix. It tastes like eating fresh peas from the garden! My little 2 year old did not want her salad for dinner last night, but decided to finish off all of the sprouts instead. So Yummy! It is such a great way to add fresh, raw food into your diet during the winter! This book is a great way for someone who has never sprouted, but who wants to get started and even someone who wants to expand their knowledge of sprouting. Great information on safe food handling practices and how to properly mix your own mix of seeds to how to remove the hulls after they are sprouted. Then there is a great section on using your sprouts. Even including a raw sprouted hummus recipe! Yum! Consider me addicted. I LOVE sprouting and eating sprouts! Happy Gardening (or should I say Sprouting)!